Aye for peasants, nay for feudalism! The Awami Workers Party (AWP) on Saturday stressed the need for land and electoral reforms in the country and held a demonstration to express solidarity with the victims of Quetta killings. The call was made at a conference held at the Lahore Press Club. The event was attended by veteran leftist leaders, human rights activists, peasant activists and intellectuals. Speaking on the occasion, AWP General Secretary Farooq Tariq said that the AWP had filed two petitions in the Supreme Court demanding land and electoral reforms. Tariq discussed the historical background of land reforms in Pakistan and said that currently, 0.29 percent of the Pakistani population had control over thousands of acres of land. He further said that a report by the Sustainable Development Policy Institute (SDPI) had revealed that at least 60 million people in Pakistan were living below the poverty line, adding that 52 percent of this population resided in Balochistan. He further said that there was a clear link between rampant poverty in Balochistan and the strong feudal culture exiting in the province. Moreover, he said that corporate farming in the country had destroyed the lives of peasants after thousands of acres of land were being leased out mostly to Middle Eastern companies at cutthroat prices. He added that the lack of government investment in the agricultural sector had further aggravated the plight of the peasants. He stressed the need to revive social and political consciousness among the masses and criticised the media for focusing on mainstream politics while ignoring the most basic problems being faced by the country. Furthermore, Tariq stressed the need for continuous land reforms which would put Pakistan back on the road to progress. Speaking on the occasion, another activist Mehar Abdul Sattar said that the Election Commission of Pakistan (ECP) should follow the agenda regarding electoral reforms. He said that such reforms would enable even a labourer to get elected to the parliament, adding that it would put an end to the age of feudalism with the introduction of new reforms. The conference also discussed the role of state institutions in repressing peasant movements across the country. Activist Jamila Bibi, a leading figure in the 30-year-old tenant struggle in Dera Saigol, said that AWP’s tenant activist Ghulam Dastagir had been in prison for the last three months after he was booked by the police under fake cases at the behest of their feudal masters. She further said that the police had played a strong role in suppressing the activists and peasants in Dera Saigol, while adding that the poor peasants were booked under fake cases, including power theft, water theft, tractor theft and livestock theft, by the police. Moreover, she claimed that the police had even resorted to using tear gas and baton charge against innocent tenants of the area. “We settled on these lands when the place was barren. Now, we are being driven out by the landlords after we have made the soil fertile with our sweat and blood,” Jamila Bibi remarked. “Revolution will come when all of us unite to become a raging torrent which will sweep away everything in its path,” she added. 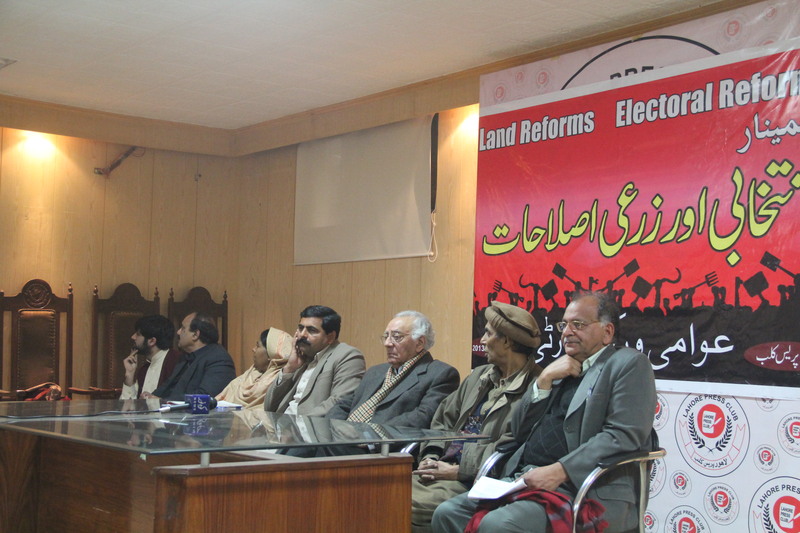 Speaking on the occasion, AWP federal committee member Professor Jamil Omar provided historical references regarding land reforms in Pakistan and said that these reforms had failed as a policy because they had been driven by political motives. He stressed on the need to eliminate the state’s role in repressing peasant movements in the country. AWP President Abid Hassan Minto said that the AWP was not just a merger between two political parties to boost their constituencies. Instead, he said, AWP was an effort to revive political and social consciousness among the Pakistani masses. Minto said that most political objectives were not achieved once a leader got elected. He said that entering Pakistan’s political structures was only the first step in a long journey for the country’s left movement which had thrust forward into mainstream politics after remaining low profile for years. He criticised Tahirul Qadri and his idea of revolution, saying that Qadri was only focusing on the removal of the current political structures but was conveniently ignoring the grass root problems of the country. Minto further said that the two petitions filed in favour of land and electoral reforms was not a revolution, it was only a small step forward to change the system from within. He further said that elections would not change the system; they would only replace one mainstream political party in power with another. Talking to Pakistan Today, Farooq Tariq said that this conference was necessary to educate and inform people about the struggles of peasants and the need for introducing electoral and land reforms in the country. After the conference, AWP activists staged a demonstration outside Lahore Press Club to express solidarity with the victims of the Quetta bloodbath that left a large number of people dead. Moreover, he said that such terrorist activities showed the nature of the state itself. Talking to Pakistan Today, AWP Women’s Wing President Sonia Qadir said that it was time to demand for serious reform at all levels of the state, starting from grass root level changes to ensuring the safety of the citizens.